We provide anaesthetic services across our hospital sites. Anaesthesia literally means ‘loss of sensation’. Medications that cause anaesthesia are called anaesthetics. 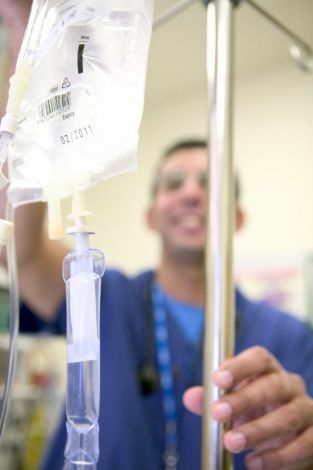 The provide anaesthetic services across our hospital sites.Anaesthesia literally means ‘loss of sensation’. Medications that cause anaesthesia are called anaesthetics. Anaesthetics are used during tests and surgical operations to induce sleep, which prevents pain and discomfort and enables a wide range of medical procedures to be performed. Local anaesthetics and general anaesthetics are two commonly used types of anaesthetics. A local anaesthetic is often used during minor procedures where a small area of the body is numbed and you remain fully conscious. A general anaesthetic is often used for more serious operations where you will be totally unconscious and unaware of the procedure. As well as local and general anaesthetic, there are a number of other types of anaesthesia. Unlike general anaesthetic, these do not make you unconscious; they stop you feeling pain in a particular area of your body. The different types of anaesthetic are described below. Regional anaesthetic - this is a local anaesthetic given to a defined region of your body, usually served by a large nerve bundle (such as your arm), giving numbness or pain relief for deeper operations where more extensive numbness is needed. Epidural anaesthetic - a type of regional anaesthetic usually used to numb the lower half of the body and good for pain relief - for example, during labour and childbirth. Spinal anaesthetic - a type of regional anaesthetic used to give total numbness lasting about three hours to the lower parts of the body so that surgery can be safely carried out in this area. Sedation - medication that makes you feel sleepy and relaxes you both physically and mentally, it is sometimes used to keep you calm during minor, painful or unpleasant procedures. Different types of anaesthesia can be used in combination. For example, a regional anaesthetic can be used with a general anaesthetic to relieve pain after an operation. Our team of anaesthetists can provide pain relief in labour. We have a dedicated 24-hour epidural service. We are able to provide epidurals using modern low dose techniques to enable the majority of mothers to achieve a normal delivery. The labour ward has 24-hour dedicated cover by anaesthetists who are resident on the ward. They will be called to give women an anaesthetic usually a spinal (needle in the back), sometime a general anaesthetic (when a patient is put to sleep) if it is required for the woman to go to the operating theatre for an operation. Women go to the operating theatre for a variety of reasons. Some women need to have a Caesarean section, for some forceps deliveries are performed in theatre, some women have tears that need to be repaired in theatre and sometimes the afterbirth does not come away and needs to be removed in the theatre. Reassuringly, most women do not require to go to the operating theatre for what is a normal birthing experience. Anaesthetists are doctors who have received specialist training in anaesthesia. They will give you your anaesthetic and be responsible for your safety and wellbeing during your procedure. they will also plan your anaesthetic and pain control with you, taking into account any preferences you have for a particular type of anaesthetic. You should ask your anaesthetist to clarify anything you are unsure about, and raise any queries you have. Your anaesthetist will carefully monitor you throughout your operation and will make sure you wake up comfortably afterwards. They may also help with any pain relief you might need following the procedure.